Clay is such an accesible and inclusive material to work with. No matter of age or ability or how ever slight the intervention, participants are always able to make their mark. 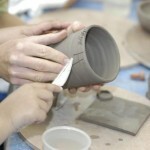 This makes clay such a fantastic medium for people with special & additional needs to work with. Artist Jon Williams has considerable experience of working with children and adults with a variety of disabilities. A two year Creative Partnership project between Beaufort School and Craftsace looking at the impact on pupils & staff of exploring clay with Jon Williams. 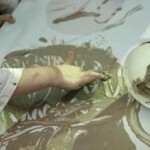 Jon’s task was to provide the children with a safe but exciting environment to experiment with clay in all it’s forms. It was rolled, pinched, torn and flattened. Thick, wet slip was smeared over hands, arms and other surfaces. Leather hard pots were cut, bashed and deconstructed. 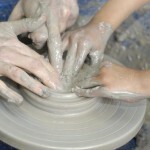 There were few barriers and the children were encouraged to experience the clay at their own level. The children were also given the opportunity to experiment with the potter’s wheel, often in surprising and unexpected ways. 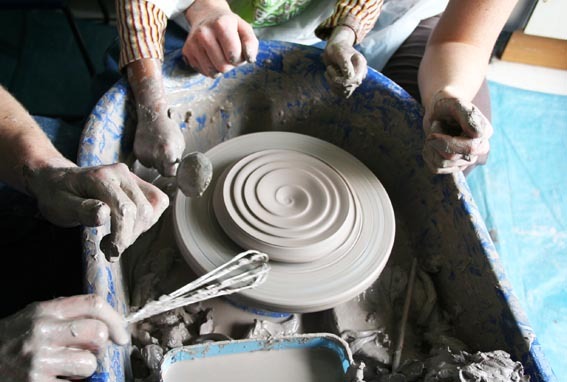 One child, uninterested by the wet clay, scraped different tools across the moving wheel-head to create a wide variety of noises, rather like a musical instrument. The project was documented by two film-makers and a photographer. The moving images and photographs proved to be a fantastic tool for reflection. 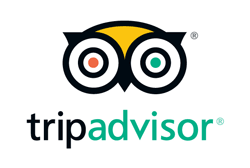 The opportunity to review each session in such detail led to a deeper understanding of the learning. In fact, the stills and video inspired Jon to make a series of new work using some of the unusal methods demonstrated by the children.